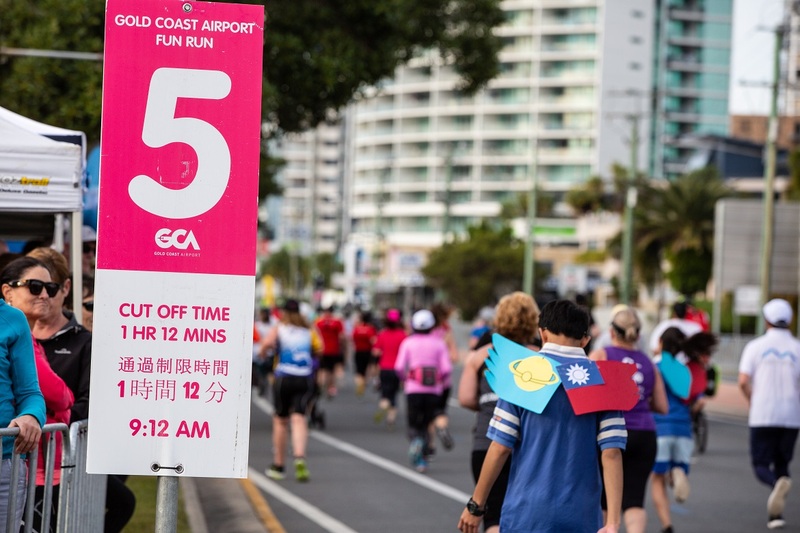 The Gold Coast Marathon encourages all entrants to read and understand its policies and etiquette before participating. Each race of the Gold Coast Marathon has an official cut off time in which entrants must complete their race. These cut off times are enforced so roads can be reopened to the public in accordance with event permits. These are all based off the gun time (i.e. the time when the starting gun is fired). Only runners, walkers, wheelchairs and prams are permitted in the events where specified below. No other form of assisted or recreational transport device is permitted without the written approval of event organisers. Animals are not permitted to accompany runners or walkers in any race. Racing wheelchair entrants are welcome to compete in the Wheelchair Marathon and the Wheelchair 15km, but for safety reasons are unable to compete in the ASICS Half Marathon, Southern Cross University 10km Run or Garmin Junior Dash events. Wheelchair entrants are allowed in the Gold Coast Airport Fun Run in day chairs only. Hand-cranked cycles are not permitted in any event. Prams are only permitted in the Gold Coast Airport Fun Run and must start at the back of the field. Please complete the pram section within the entry form. The child’s entry is free of charge however if the child would like to receive the entrant rewards they must pay the entry fee for them. A parent/guardian is permitted to accompany a child for free in the Garmin 2km Junior Dash only. Please complete the accompanying parent section on the child’s registration form. Parents are not permitted to accompany runners in the Garmin 4km Junior Dash. The use of iPods and mp3 players is discouraged in all races for the safety of all entrants. Always follow the directions of all race officials and emergency service personnel. Position yourself at the start line according to the Start Zone you nominated when completing your race entry. It is clearly printed on the front of your race number to allow a smooth start for all entrants. If you wish to run with friends/family and they are in a different Start Zone you may start in a slower zone than that printed on your race number (e.g. someone with a B Zone label may start in B, C, or D but not in A). Entrants who are walking in the Gold Coast Airport Fun Run must start from the rear of the field. Please do not stop or change directions suddenly. The Gold Coast Marathon will monitor race day weather conditions to determine if extreme heat or other weather conditions will have an adverse effect on entrants and associated events. Through our duty of care to our entrants, we reserve the right to indefinitely cancel or delay an event/s at short notice in the interest of entrant safety. The hot weather policy is consistent with Sport Medicine Australia’s Hot Weather Guidelines but entrants are reminded that they also have a duty of care to themselves and should only undertake the event if they are adequately prepared and medically fit.